Alice Ryouhei will leave high school soon, but he's trying to avoid thinking about his future. Late one night, when he's hanging out with his tough friend Karube and his silly, girl-crazy friend Chota, they see fireworks. After one blindingly bright explosion, they find themselves waking up in a different world. In this "Borderland," people are forced to either participate in potentially deadly games or simply die. Will Chota, Karube, and Ryouhei be able to survive this dangerous new world, and is there a way they can get back to their original lives? Neither the question nor the answer to it might particularly interest you, yet reading this manga's attempts at trying to give you answers to this very question can still be a great investment of your time. The name might strike you as very odd, "Alice" from Disney and in"the borderlands"? Will there be over-the-top humor and a little girl protagonist or what? Borderlands primarily targets 2 kinds of audiences. The first one being people who enjoy to read manga with games of life and death and an abundance of characters that make these sort of games interesting to spectate. The second one are people with a very reflective or depressed personality. The manga manages to find a good balance between keeping dark/serious topics with drama and feels at the core and still keeping a very shounen-esque positive, friendly atmosphere that manages to turn heart-tearing stories into heart-warming experiences. Don't mistaken this with material like One Piece or Naruto, just because it wears the shounen tag. This manga is rich with consequences. You'll see people die for taking wrong steps at every turn. However, this isn't a Tokyo Ghoul or Re:Zero either. The characters have heart and are relatable to a certain extend. The writer did a good job trying to portray people that you could possibly meet anywhere. The weakness in the writing for this work shows when characters start to act overly corny or when characters start to emotionally overreact at times. It makes you question whether the story even knows where it wants to go or if it doesn't know which audience it wants to target. The truth of the matter is that Alice in Borderlands knows exactly where it wants to head with it's story and that it is doing what it is doing almost too well for it's own good, because what it is doing is neither popular nor wanted in most of the anime sub-communities. Alice in Borderlands applies a concept that is alien to most anime watchers and resented amongst many manga readers: The attempt to tell a story with a clear message through a storytelling that let's you look from different camera angles and let's you see the stories of different characters, distancing itself from being too judgemental or imposing and instead allowing readers with a free mind to think for themselves. The main character, Arisu, is the person you'll be following throughout most of the story. He's not shounen-MC-level of stupid, but he's not a Yagami Light either. 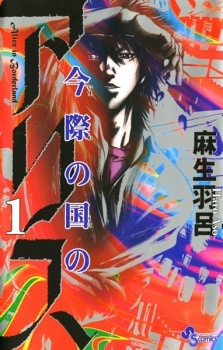 If you're into badass main characters, this manga will probably not do for you. The main character's attitude throughout the story fits the atmosphere of the manga very well, which is melancholic. So don't expect some ruthless guy finishing off adversaries in cold blood. Ever read one of those Battle Royale kind of manga, where a bunch of people are thrown somewhere and expected to kill each other off with certain rules in place? This is basically one of those. The setting is some unknown, wide open area with certain places marked for games of life and death to be held there. None of the people there are forced to participate in these games. But finishing a game and surviving it extends the time on the victors visas, which will otherwise eventually expire, resulting in certain death. To make the games more interesting, the manga introduces different game categories and difficulty levels represented through playing card symbols and it attributes characters that are especially suited to a certain kind of game with that category. There are, for example, games that require intellect to survive or games that require physical fitness. But it's more than just a myriad of death games following each other. The manga forces characters to face questions that you would typically try to avoid having to deal with. In that sense, you are being shown not only the ugly sides of the reality of the story and those questions, but also the brilliance that lies with all the different possible answers. That's why the stories of these dozens of characters you'll be following are not just some decentralized, loosely tied one-shot stories to their own, but branches that come together at the end to form a whole tree. While there are a lot of great characters, there are also some very annoying ones. On top of that, the story burdens you with some very ugly, dislikable character designs for some characters. In the end, nothing I describe about the characters here will be on-point, because it's just too dependant on taste. However, one thing that can be said about many of the characters is that they act very appropriate considering the circumstances they find themselves in and considering their states of minds. And, I just have to say it, as if the constant whining of the MC wasn't enough during some chapters, they just had to add the probably most annoying side-character to tag along with him and become his mental and physical support. At least in that regard this manga is very alike to almost every other manga you might've already read, with it pandering to self-absorbed hikikomori due to the relationship going on between that self-insert of a MC and his on-command make-up doll and inofficial girlfriend. I enjoyed this a lot, despite not being overly comfortable with many of the early cast and despite the manga sometimes giving you the feeling that it's trying to let the world revolve around that self-centered MC at times, with entire chapters contributed to nothing but whining from Arisu that I gladly skimmed through with a good fast-forward reading technique, called the autopilot. I wanted to read some manga with survival games going on, where there are stakes for the characters and not some illogical happy ends for the sake of letting friendship win. Alice in Borderlands delivered. And it also made for a story with some depth to it, which I gladly took as the icing on the cake. It's far from perfect. There are just too many annoying and unnecessary scenes in this manga for a 10/10 and there are in fact so many of those that if you are either just enjoying to read for the brutality going on or just enjoy the story, but don't get enough enjoyment out of the action that a 7 or 8 out of 10 would be a fair rating. For me it's a 9/10. This is the best survival manga and overall manga I've ever read. I'm not the type of writing reviews, and I don't even know if someone will read this, but I just wanted to put in words my thoughts about this work. If you like survival games, this is for you. If you like reflecting, this is for you. If you want a mix of happiness, surprise, anger, sadness and greatness, this is for you. Everyone has different tastes, but I don't know a person I wouldn't recommend this work to. This is truly a masterpiece that, beyonds giving you pleasure, changes the way you view the life (atleast, it did to me). Well, I still think these words don't express what this manga is, and if I can even express it with words, so READ it. I swear you won't regret it, really. The manga is based on a high school student who is about to face the tomorrow of independance,he makes a wish that brings him in a world of joy at the start,but good things may not last long. He and his friends face the cruel reality of this dreamy world...a place where the strongest survive.The manga is well written with a great variety of characters and some quiet cunning thinking,I really love it so far I am looking forward finishing it.Whoever looks into it and they are in for survival they are not going to regret it! Although everything good has it's cons as well.There is not much character development overall or it might be predictable to see how they are going to change.The manga does not tire you but as a psychological-survival it contains some explicit content so I advise you to read it if you are mature enough *smiles*. That was all from me have a good day! My review is separated to 2 parts , first contains my review for general plot , and the second my review for the end , so If you haven't read the manga yet , I recommend to take a look first . Basically this anime is like Kaiji ( survival and psychological ) , No game no life ( game / puzzle ) , btoom ( survival ) in my opinion . In general , the main character and his friends have an ordinary life , but one day they were transferred to an unknown world , but after that they were involved in a game , and after that the secret of this world is revealed , basically if you want to continue residence you need to recharge your visa ( of this word ) by playing games by putting your life in danger , otherwise when your time limit reaches ( visa ends ) you receive your end by a laser from the sky penetrate your head . What I have liked the most , is the psychological stress is all games , especially the heart one ( psychological game ) , the kill between the players to survive . Every game , make you feel that the mangaka is genius game player . after reading the end , I was pretty disappointed . For me , I think that there still nothing clear for the reason why there were transferred to the borderlands , And making all things like there were just dreams make it more and more bad , and also if the meteors were the reason of the transfer , does the borderlands repeat July month as it was said , and how the players gonna continue to transfer to the borderlands without meteors ( if that the real reason ) .